Cut 8 large refrigerator biscuits into 8 pieces each (pizza cut). Spread in the bottom of a greased 9 x 13 pan. Brown 1 pound of breakfast sausage. Sprinkle over biscuits. Chop and saute 1 red pepper and 1 green pepper. Spread over meat. In large bowl, whisk 8 eggs (salt and pepper to taste). Pour over meat and vegetables. Bake in a 375* oven for 30 minutes, or until eggs are set. Sprinkle with cheddar cheese and bake for 5 more minutes, or until cheese is melted. 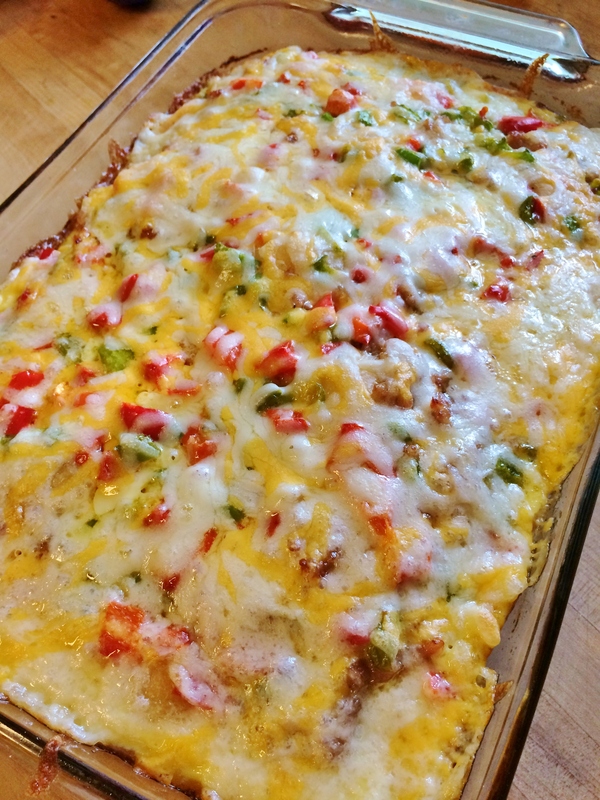 Posted in BreakfastTagged biscuit, brunch, casserole, cheese, crowd, Easy, eggs, peppers, recipe, sausageBookmark the permalink.